The UK new light commercial vehicle (LCV) market saw year-on-year demand increase by 10.6 per cent in March, marking the sector’s best ever monthly performance, according to the latest figures released today by the Society of Motor Manufacturers and Traders (SMMT). Registrations in the month accounted for almost two-thirds of the quarter’s volumes, as business buyers took advantage of new models and strong market incentives. 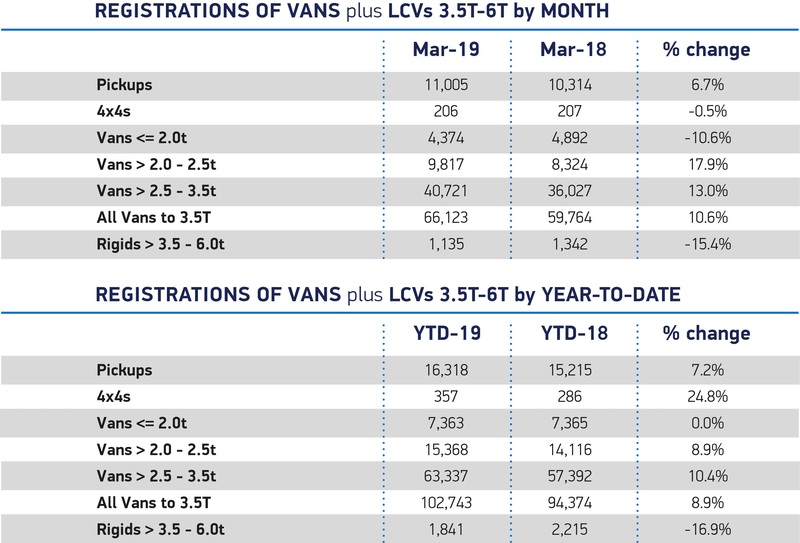 More than 66,000 new vans and pick-ups hit British roads in March compared with the same month in 2018, an uplift of 6,359 units. Both medium vans weighing 2.0-2.5 tonnes and large vans weighing 2.5-3.5 tonnes saw double-digit growth, with demand rising by 17.9 per cent and 13.0 per cent respectively. Registrations of pick-ups also rose, by 6.7 per cent, to more than 11,000. Meanwhile small vans weighing less than 2 tonnes experienced a decline, falling -10.6 per cent. March rounded off a positive quarter for the sector, with demand for new LCVs up 8.9 per cent on the same period in 2018, at 102,743 registrations.